Download Theme, Symbolism, Question Answer of the poem The Sick Rose for Class XI (11) for West Bengal Class 11 Exam. The Sick Rose by William Blake. Describe the rose and the worm. Describe the love relationship between rose and worm. “And his dark secret love / Does thy life destroy.” – explain. “O Rose thou art sick.” – explain. “Has found out thy bed / Of crimson joy” – explain. 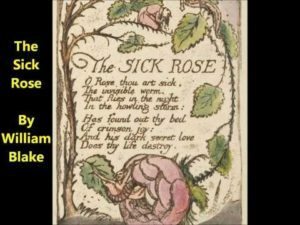 ‘The Sick Rose’ is a well known poem which is written by the great poet ‘William Blake’. At first the poet addresses to a rose which is very sick. The Invisible worm which flies in the howling storm in night. The worm has found out on the bed of rose. The worm enjoys crimson joy by cutting its Petals. The poet explains that this is the love of worm to rose which is dark and secret. At last the worm destroys the life of the rose. Through this poem the poet wants to compare between positive and negative symbolism in social life. The rose is the symbol of innocent where as the worm is the symbol of cruelty, guilt, destruction. The purity and innocence is destroyed by the destructive experiences of the villain ‘worm’. The poet ironically describes the work of experiences by the worm which is so call ‘love’. Actually it is not love of the worm but such behaviour of the worm is dark and secret in society. It is dark love because rose’s destruction has happened at night by evil. It is secret because no one knows about the incident. Simultaneously good is being destroyed by evil in society. Rose save the life of worm but worm enjoys by destroying the rose’s life. This is the main theme of the poem. Ironically this poem is a perfect piece. The poem is perfect for symbolism elements such as ‘crimson’, ‘love’, ‘bed’, ‘secret’, ‘invisible’, ‘sick’ etc. The rose is – sick. The worm is – invisible. The worm flies- in howling storm in night. The storm is – howling. Crimson joy refers to – the bloody enjoyment of the worm. The worm’s love is – dark and secret. The worm destroys – the rose’s life. Rose is the symbol of – love. The worm is the symbol of – destruction. Dark stands for – night. The love is secret because – no one knows about it. This poem is taken from – ‘The Songs of Experience’. This poem is an – symbolical poem. Rose stands for – innocence and love. The worm’s love is – destructive. Crimson means the color of – red. Where from is the poem taken? The poem is taken from the poem sequence ‘The Songs of Experience’. What kind of a poem is this? This is a symbolic poem. What does the rose / worm stand for? Rose stands for beauty, purity, innocence, kind, love etc. The worm stands for evil, destruction, villain etc. When does the worm fly? The worm is flying in night in the howling storm. Where has the worm entered? The worm has entered in the bed of rose. Why the rose is sick? The rose is sick because the worm enjoys crimson joy by cutting the rose’s petals. Why the love of the worm is dark and secret? The love of the worm is dark because it has happened in night and this work is done for the rose’s destruction. The love of the worm is secret because no one knows about the evil work of the worm for the rose’s destruction. How is the worm described in the poem? The worm is invisible. He takes the shelter in rose’s bed in howling stormy night. Whose bed is referred to here? The rose’s petals are referred to here as ‘bed’. What does the crimson joy indicate? Crimson joy indicates the destructive bloody enjoyment of the worm. Whose life is destroyed and why? The rose’s life is destroyed because the destructive worm destroys the purity of the rose. How does the worm destroy the life of rose? Taking shelter in rose’s bed, the worm destroys the purity and beauty of the rose by cutting it’s petals. One Response to "The Sick Rose: Theme, Symbolism, Question Answer for Class XI (11) WBCHSE"